European car registrations fell sharply in April with a 7.1% drop, marking their second drop in the last three months for what is intrinsically a volatile series. Sequential growth rates, comparing 12-month to six-month to three-month growth, show registrations are decelerating on that timeline for Europe as well as for each of the detailed countries except Germany. However, Germany’s three-month weakness is the weakest of all. The growth rates calculated from three-month moving averages meant to reduce the impact of volatility and to reveal a truer trend also demonstrates this clear deceleration pattern as growth rates for Europe progresses from 4.2% over 12 months to 2.8% over six months and down to -8.3% over three months. These calculations reinforce the message from other data that has showed that a European slowing is in train. 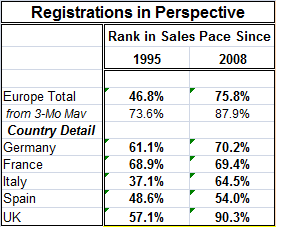 The small table on Registrations in Perspective ranks the current sales pace vs. two historic periods. One looks at the ranking just since the financial crisis and the other takes a longer perspective back to January 1995. For all of Europe, the current sales pace is in the 75th period since January 2008. For the longer periods, the rank is in its 46th percentile, below its median. These metrics inform us that registrations are relatively firm by the standards of the post crisis period but still are weak compared to a broader previous period of normalcy. Only France and Spain show very similar rankings for both periods. Other countries show the post financial crisis registrations as ranking much higher. The U.K. is the most extreme case of this, with registrations compared to other registrations since 2008 ranking in the 90th percentile but only in their 57th percentile on a broader timeline comparison back to 1995. Rankings constructed from three-month averages show for all of Europe a strong 87th percentile standing compared to observations since 2008 vs. a 73rd percentile standing over the period since 1995. Looking at a much more smoothed series the 12-month pace divided by the 12-month pace for the previous 12 months, a very slow moving calculation, shows that for Europe, registrations are up at a 5.2% annual rate. Spain logs a 9.7% annual rate; France and Italy post similar gains of 6.5% and 5.5%, respectively. Germany shows a gain of just 3.8%. Only the U.K. shows a decline on this basis with registrations falling 7.9% broadly. The EU commission survey on retailing shows that retail has been weakening recently as well. Oddly, consumer confidence readings have continued to be quite solid. I remain skeptical of what consumer confidence means to Europeans. In Italy, for example, confidence has been quite good; yet, there is a great deal of political discord and a new government is being formed that aims to restore and initiate a host of fiscal spending measures that are simply going to break the bank in Italy at least as far as the Maastricht conditions are concerned. Clearly, Italians are restive and it is hard to understand why they are looking for so much change if their consumer confidence is so strong. Europe has become the new hot spot to monitor because of the emerging Italian factor. Who knows what’s next?